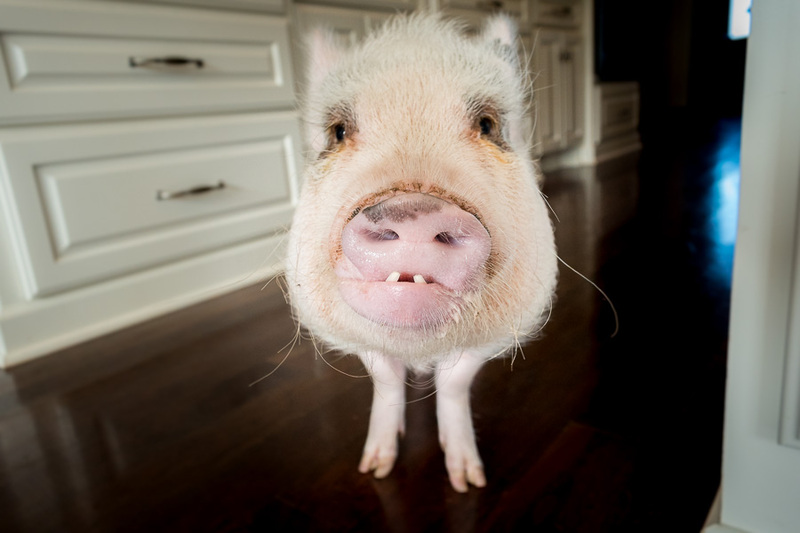 Mini pig Oscar has started losing his teeth! 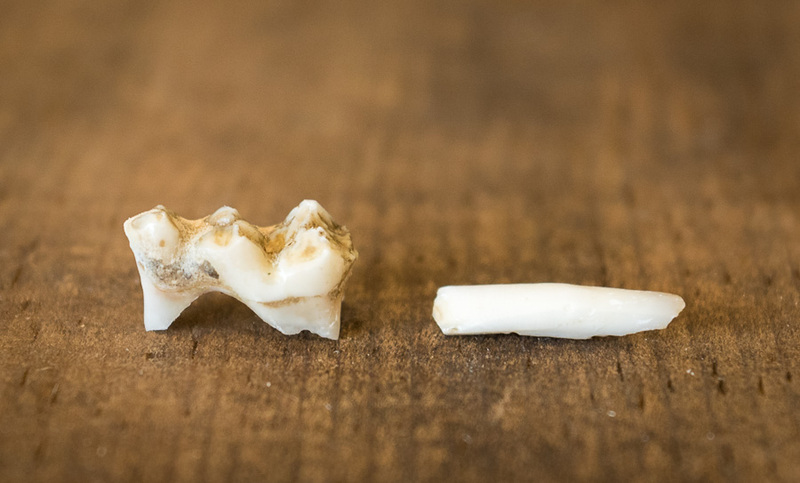 He started by losing his back teeth, but just yesterday he lost his two front teeth. Oscar lost his two front teeth yesterday! Although I felt awful knowing that Oscar was dealing with teething pain, I was also a mixture of excited and weirded out by the idea of him losing teeth. On one hand, it’s a sign that our little guy is growing up and gets us closer to being through his teething phase. On the other hand, I’m not used to finding teeth around the house. I also had a bunch of unknowns, like how would he lose his teeth and what would they look like. I soon got my answer about how Oscar would lose his teeth. For the first tooth, I was walking through the house and just noticed it on the floor next to his food bowl. I was a little sad that I missed him losing his first tooth, but I was excited to have found it. My best guess is that he lost it while eating his dinner since it was so close to his bowl. For his second tooth, he was also eating dinner, but this time he finished his meal, looked up at me, and then just spit out his tooth. After the first two, we’ve had a mix of him spitting teeth out, swallowing them, and us finding them randomly around the house. Since I’m used to seeing Oscar’s skinny front teeth, I was surprised by how big his back teeth were. It makes sense to me now that I realize his back teeth are larger, but it caught me a bit by surprise at first. On the left is one of Oscar’s back teeth. The right is one of his longer bottom front teeth. It was only appropriate to celebrate Oscar losing his teeth, so the tooth fairy stopped by for a visit. We got Oscar his very own tooth fairy helper, read him The Night Before the Tooth Fairy , and then he went to sleep, eagerly anticipating what the Tooth Fairy would bring him the next morning. When he woke up, he was so excited because the Tooth Fairy brought him the book he’s been wanting – Prissy & Pop: Big Day Out ! The book was everything he expected, and he loved seeing the adorable pictures of Prissy and Pop and hearing about their adventure. He looks pretty silly without his two front teeth but also ridiculously adorable. I’ll be excited once we’re past the teething phase because I hate knowing he’s uncomfortable while he’s growing in new teeth. But, for now, he’s happy with his new book and is hoping the tooth fairy comes back with more surprises as he loses more teeth. Note: Some of the links above are affiliate links. LifeWithaMiniPig.com is a participant in the Amazon Services LLC Associates Program, an affiliate advertising program designed to provide a means for sites to earn advertising fees by advertising and linking to amazon.com. Thanks for connecting with me on Twitter! Our Lewis is going to be 4 this December…it’s hard to believe how the time has flown. 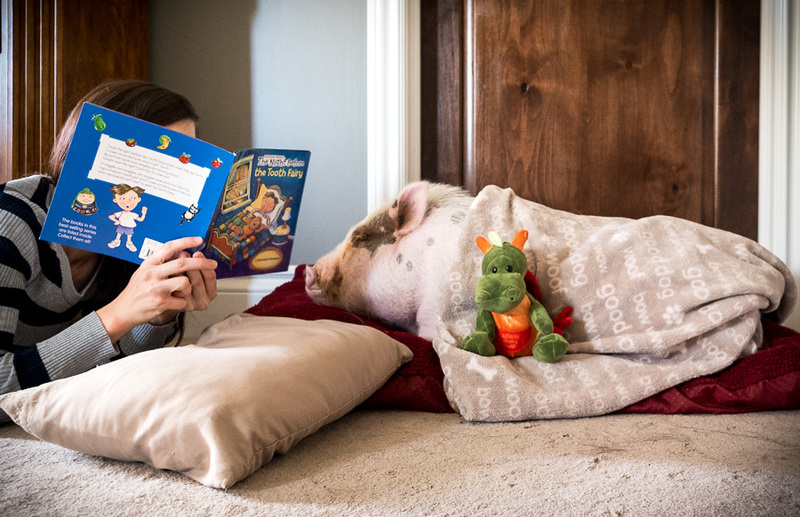 I would not trade pet pig parenting for anything! It’s been a dream having him around – he’s a certified member of our family. We got him at 5 weeks old and we did have to scale some hurdles early on like establishing who is alpha-pig around the house here, potty training, curtailing the nipping and such but the experience having him has been beyond rewarding. He fits in so well here. He loves to spend his time outside grazing in our fenced yard during the day. We live on a golf course and he’s famous around here. All the golfers look for him and call his name as they pass by! At night he’s most decidedly an indoor pig. He’ll bray at our door when he’s ready to come in. He has a sound for every mood, hunger, frustration (I call it the “old man” groan), greetings (the ha-ha-ha sound when you put your face close to his) and I know them all. He listens to and heeds my directions and understands me like no other animal has before. One of his favorite things to do is undo the Velcro on my sandals. I’ll strap them on and he’ll come around and undo both, then the cycle begins anew. He loves it. It just gets better. All of the things you are dealing with will smooth themselves out – I found out that the nipping and head swiping don’t happen as long as you don’t put your face at the same level as theirs – I think they are territorial with that specific airspace. As long as you are above or below their personal space, you can be near them and everything seems to be good in that department. As you likely know by now, they love routine. That’s fortunate because so do I. Lewis and I have our daily rituals and he’s happiest when we follow them even keeping the time of day when things happen consistent. I think you’ll find if this lifestyle suits you, they will behave a lot better. This took a bit of time to figure out but we found the sweetspot. I feed him the Mazuri Elder 2x a day and he lets me know when its mealtime, you can set your clock byit 🙂 Otherwise, he gets small morsels of whatever I am cooking or eating – he loves to cook – he’s my sous-chef in the kitchen! He did get rather large in size – outgrew both parents but we love him regardless. He’s a great sleeper as well as cuddler. He’s gotten too big to jump into our bed (he used to do that often and sleep with us) so now he has his own setup in our living room complete with thick pillows and blankets. I tuck him in every night as he goes to sleep – he LOVES to sleep and he’s as quiet as a church mouse at night. I could go on and on about Lewis. I look forward to following your posts and learning more about Oscar. Nice to meet up with a fellow pig-parent! 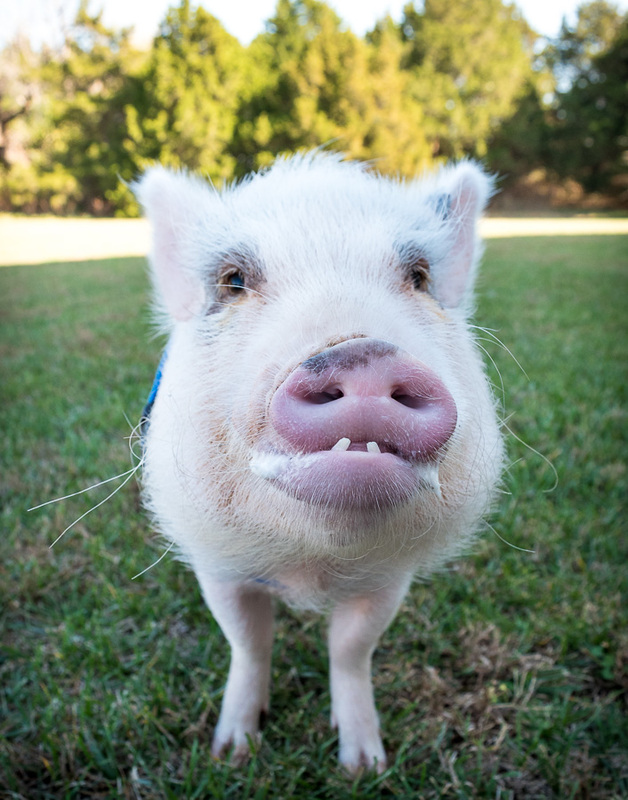 Pigs really get a bad rap – most people out there have no idea what they are missing. Thank you SO much for this! It’s really helpful to hear from a pig parent who is “ahead” of us since Lewis is almost 4 years. We are at the point where we are in new territory lately, and we’ve had some struggles. I heard from another more experienced pig parent once who said the struggles change as pigs get older, and that’s been absolutely true. We had the bonding/trust issues in the beginning, but those are now far behind us. Then we went through the nipping and biting which MTP helped (not fixed, but helped), and now we are dealing with Oscar charging at guests which he has never done before. He used to always love guests, so this is new for us. We’ll learn how to handle this too, but it’s been a new challenge. We have good days and challenging ones, so it’s really helpful to hear that things smooth out as they get older. I also do well with routine, so Oscar and I are on the same page there…haha. We recently had contractors and just more people in the house than usual, and I think that’s been hard for Oscar and is likely what started the charging. So, now that things have calmed down, hopefully he’ll get back to his normal (wonderfully grumpy…haha!) self. Thank you so much for sharing! I started this blog just to share my experiences and like to help people when I can, but I also try to remind everyone that I’m just a first-time pig parent learning as I go. So, I’m always grateful when other pig parents share their experiences and help us out too. Oscar drives me insane AND I love him to pieces, usually at the same time. 🙂 Feel free to share on here and give advice any time you want! Sure, I am happy to share. Lewis definitely gets stressed when there are loud noises in the house. This could be anything from a vacuum cleaner, an object falling or anything sudden that startles him. His back hooves start churning and he gets excited (not in a good way). 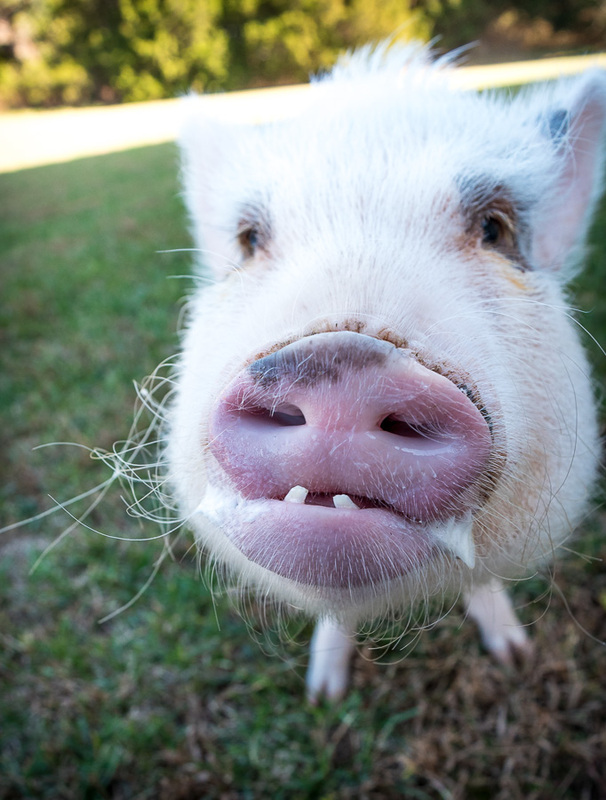 Along with their acute olfactory systems, you’ll come to know that pigs have extremely sensitive hearing. He can be out in the middle of the yard, I come into the kitchen and he’ll hear something subtle like me clacking the silverware and he’ll come running to the door thinking he’s getting a snack! The charging guests thing is not one I have experienced with Lewis. He does like feet and shoes when people arrive at the house and early on he did nip at guests but fortunately at the time their shoes were on. There are all sorts of smells that come in from the outside and that is a real treat for them. Perhaps Oscar is nipping thinking that there might be food involved. I have a feeling that is rooted in (no pun intended) the change of routine with all the contractors and guests about. That’s a consistency buster for pigs and it’s likely why he’s acting up. The only time that’s tough for us is about 30-45 minutes before mealtime. He starts grunting and making the old man noise. I try to feed him promptly at 6, morning and night and that seems to suit him. I think they operate with the sun so whatever time sundown is, you should try and plan the meal for them. We just had the daylight savings time switchover so I adjusted him from 6:30 to 6 using 15-minute increments over 2 days. If Oscar is anything like Lewis, all of this unwanted behavior will calm down as he matures and then you’ll be left with all the pros – a sweet, gentle, loving and entertaining companion. They’re not full-grown or fully mature until about age 3 and they remain as toddlers for the rest of their lives which, I think, is a good thing. We rely on each other, perhaps it’s co-dependency but it seems to work for us. I ‘m happy to share and answer questions anytime, I love talking about our Lewis. I do have a funny update to share. It’s starting to get cold here and Lewis has found his way back into our bed with us! To give some background, we have a high king-size bed which is at least 3 1/2′ from our bedroom floor to the top of the mattress. Early on, when Lewis was a piglet, my wife and I used to have him sleep between us. He was always seeking warmth, even during the summer months. As he grew in age and size, the frequency of his visits to our bed diminished and he started getting used to his pig bed and also sleeping in my son’s bed – depending on his mood, he’ll go to either place. We got to a point when he stopped coming to our bed altogether. Now fully grown, I figure he’s about 125 lbs. around 4′ long and 3’ high – the size of a large dog. Over the weekend, it got down into the 40s and he came in from the cold so I lit the fireplace for him and put one of his beds there. He loves camping out in front of the fire when it’s cold out. I cannot overemphasize this more – pigs love fireplaces in the winter months! So that night, he woke up sometime during the wee hours and came into our room clucking. I could tell he wanted something because I understand his tones. I asked him to “show me” and instead of leading me out of the room which he usually does (to the kitchen for a snack or to go outside for a potty break). He came right up to our bed and much to my surprise, with no running start, jumped straight up onto it! It had been at least a year since the last time he slept with us and I thought he had just grown too large and heavy to jump up on his own. I can’t lift him up anymore but I am able to give him an “assist” getting down off the bed. So he slept like a baby between us under the covers with the electric blanket cranked up along with the cushy comforter – let me tell you, he was loving life! Last night, after he had finished his dinner, we were in the middle of something else. When we went into our bedroom, sure enough, there was our Lewis up on our bed sleeping soundly under the covers! He must have gone in there and jumped right up on his own. I guess he’s re-discovered the comfort of mom and dad’s bed 🙂 Now I guess he’s got 3 possible places to sleep! It is great to hear from someone who’s pig is older than a few months. It lets us all know what to expect after 1 year old. How big is your pig now and when did he stop growing? Hi Desiree, Lewis reached full stature at around 3 1/2 years. He’s about 3′ long from the scruff of his neck to the beginning of his tail and about 2′ tall. Last time he was weighed at the vet he was about 85 lbs. but that was a while ago so I think he’s over 100 lbs. by now. I hope this helps and I would be happy to answer any more question you may have. I love your comments so much. I can feel your love for Lewis, amd it matches my own deep fondness for my Popper. We have a special bond like noone else in our family. I had no idea how social minipigs are. Popper definitely needs his people! He gers grumpy if we leave him in the kitchen too long by himself. I too have begun finding his baby teeth. Stepped on one a few minutes ago, in fact! 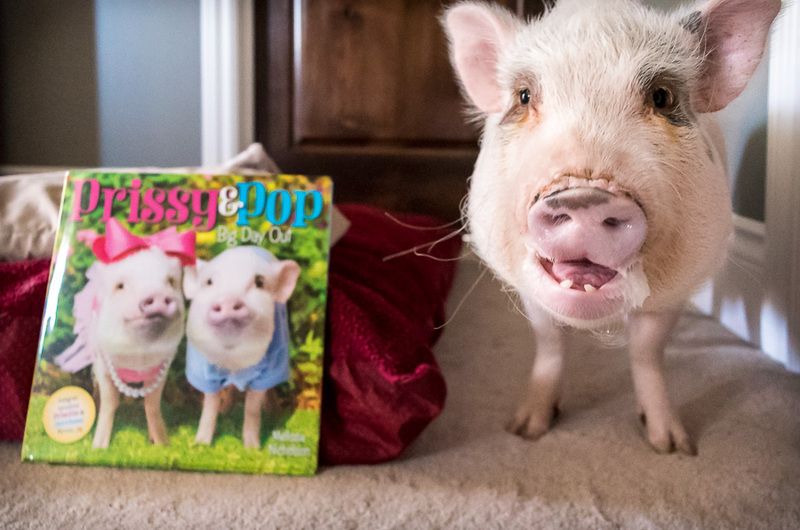 We love Prissy and Pop too, and their book is awesome! Oscar already has their Christmas book on his wish list…haha. Yeah, the teeth thing is an interesting experience. It’s a bit embarrassing to admit, but I get really proud of Oscar when he loses his teeth. That feels really strange, but it’s true. 🙂 Although, I also feel badly for him because his teeth and gums have to hurt. Remembering that helps me to be a bit easier on his behavior when he’s teething because I know he’s uncomfortable. Aww, his funny mouth looks even cuter with his bottom teeth missing. I only have a few of Elmer’s teeth, but only the molars. I think he swallowed the rest.